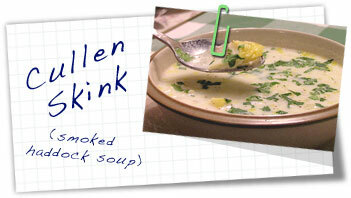 This is one of my favourite soups ever. It reminds me of sitting in a cafe in Edinburgh’s city centre watching the shoppers pass by. Laughing as they are thrown about by the freezing gale force winds as I sit, all smug and warm, scoffing my face with this delicious creamy soup. Generally, Scottish grub is firmly on the forgettable side, but this little smoky treat is one dish worth singing loud about. Place the haddock in a large pan and cover with water by about 1cm. Bring to the boil and simmer for 4-5 minutes. Remove fish and peel off the skin and remove the bones then break into flakes. Return the fish to the water, add the onion and bay leaf and season with salt & pepper. Simmer on a medium temperature for 15 minutes. Strain the liquid back into a pan. Set aside the fish but remove the bay leaf. Add the milk to the liquid and bring to a simmer. Gradually add the mashed potato to create a thick creamy consistency. Return the fish and heat for 1-2 minutes. Remove from the heat check for seasoning and drop in the butter just before serving. Serve with plenty of parsley and spring onions sprinkled over alongside fresh crusty bread.